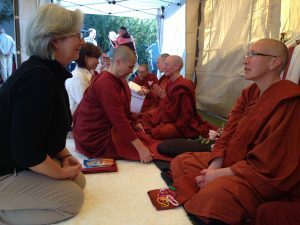 One of the joys of the Western Monastic Gathering is getting to know fellow monastics in the varied traditions. As buddhism spread over the centuries the Dharma was influenced by cultures of each new country. 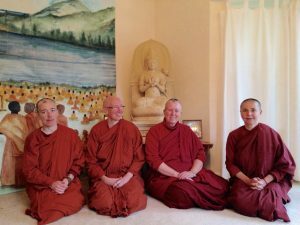 The vinaya, or code of rules for monastic life, unite all monks and nuns. In some countries minor rules were set aside as they might cause the Sangha to be less respected. We could say that Theravadin or Early Buddhists have the most conservative views and Tibetan the most liberal regarding what might be adjusted for modern life. Therefore it is a joy to be in the company of those living closest to how the Buddha lived. changes to wet and fertile, with all forms of life emerging- especially insects covering the ground by the thousands. The retreat prevented the monastics from stepping on the insects. After the retreat monks and nuns are offered requisites for life by the lay followers; food, medicines and cloth for robes in a beautiful ceremony called katina. 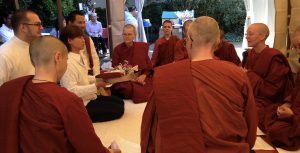 The ceremony at the Karuna Vihara or monastery began with an alms round for the assembly of nuns who completed the retreat and guest nuns. In some countries this is practiced daily, with long columns of monastics going into villages to receive sustanance. In this case, we filed from a small apartment t o the back yard that had been converted into a community center with tents and chairs. The lay sangha made a circle around long tables laden with pot luck offerings. They each held plates of rice in their hands. We nuns carried large begging bowls and each member placed some rice in our bowls. Then we all partook of the potluck. Although living by donation, rarely have I had the opportunity to do an alms round. I felt a very special personal connection to the generous hearts of each person offering my meal. It was quite joyful all around. The katina ceremony is unique as the lay followers have to request to offer katina. Three followers this year wished to offer cloth to the nuns for robes. A beautiful tray was arranged with the cloth and flowers. Each lay sangha member touched the tray to be included in the offering. There is beautiful chanting in Pali to make the offering to the nuns for the nun who’s robe is now worn and threadbare. Then all the nuns gave short Dharma talks. I was struck by the diversity of the followers; Indian, Filipino, Vietnamese and European families were equally represented. After the public ceremony the nuns gathered to make a robe which needed to be sewn before dawn the next day. The cloth was washed ironed and placed flat to be measured into a pattern that is reminiscent of rice fields. Sometimes the material even needs to be dyed. The nuns sewed together all night like the old quilting bees of my grandmother. It is very moving to witness these old traditions practiced with such joy and appreciation. It is particularly significant to see nuns leading the ceremonies and their monasteries with such grace and dignity!